RPA Using UiPath Training Course: Building the professional's RPA expertise from the ground up using the advanced UiPath RPA platform, this course will prepare the professional for the RPA Developer Advanced Certification exam, recognized as a premium certification in this space. The professional will stand to gain real hands-on exposure to creating RPA bots, designing effective RPA solutions, and automating repeated processes within the organization. 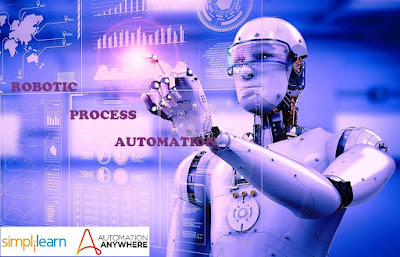 Automation Anywhere Certified Advanced RPA Professional Training Course: This course will build the professional's ability to demonstrate a good understanding of RPA, Automation Anywhere, enterprise platform, its architecture, components and various features and functionality. Also builds Knowledge in how to create bots using different types of recorders, skills to use various recorders, editors, and commands to build bots to automate simple processes and importantly to apply RPA knowledge in real-world scenarios. Simplilearn enables professionals and enterprises to succeed in the fast-changing digital economy. The company provides outcome-based online training across digital technologies and applications such as Big Data, Machine Learning, AI, Cloud Computing, Cyber Security, Digital Marketing and other emerging technologies. Based in San Francisco, CA, Raleigh, NC and Bangalore, India; Simplilearn has helped more than one million professionals and 1000 companies across 150 countries get trained, acquire certifications and reach their business and career goals. The company's high-engagement curriculum blends self-paced online learning, instructor-led live virtual classrooms, hands-on projects, student collaboration and 24/7 global teaching assistance. Simplilearn is a GSA IT-70 contract holder and was recognized by Training Industry as a Top 20 Online Learning Library Company of 2018. For more information, visit www.simplilearn.com .